Also known as Black Tupelo. Height 20 to 30 feet. Spread 30 to 50 feet. A native tree of great ornamental and wildlife value. 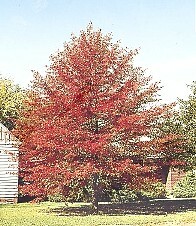 A handsome pyramidal tree of medium vigorous growth with waxy and lustrous dark green leaves 3 to 5 inches long turning a brilliant red in the fall. Female trees produce a small blue fruit that birds relish. This tree grows on dry upland sites or just as well in moist or wet sites where other trees will not grow. Good wetland species.